The never-ending efforts of the automobile industry to provide performance is evidenced by the high infiltration of impressive-looking sports cars that dominate the roadways in North America. 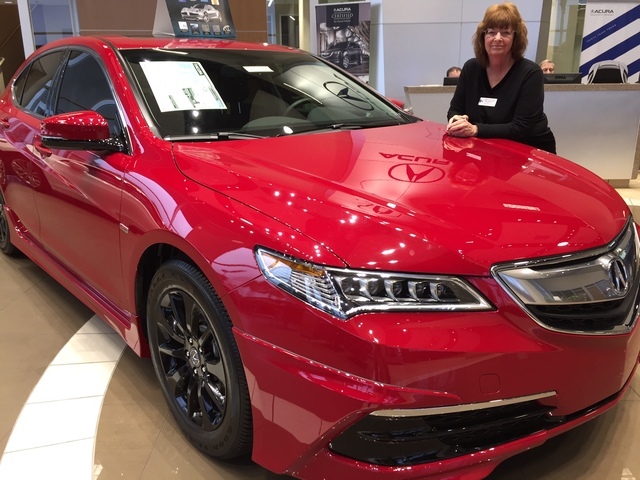 COURTESY Longtime Acura sales consultant Mary Weisbrod shows off the 2017 Acura TLX at Findlay Acura in the Valley Automall. Count the 2017 Acura TLX at Findlay Acura as the perfect vehicle for drivers who want the performance along with the smooth ride that the car provides. Considered a “two-for-one in the midsize segment” by Car and Driver Magazine, the TLX is available in two strengths: either a 206-horsepower, 2.4-liter inline-four or a 290-horsepower, 3.5-liter V-6. The 2017 TLX has a long list of features on the Tech model that include all of the modern options such as lane departure warning, lane keeping assist, blind spot recognition, collision warning as well as a backup camera with three views and a cross-traffic camera. In addition, the Tech model has a moon roof, Bluetooth technology, heated seats, Home Link to preset the garage door, Acura Link concierge service that provides verbal communication, 5.1 six-channel Surround Sound, a 15-gigabyte music memory storage and push-button start. Also, the four-cylinder model features a gear shift, while the six-cylinder model has button shifting. Both have paddle shifting clutch. Keyless remote start is a feature popular with Las Vegans, particularly in the summer. “The Acura TLX looks good, and it’s very safe,” said Mary Weisbrod, adding that the TLX has a five-star safety rating from the National Highway Traffic Safety Administration. Weisbrod drives a 2015 Acura TLX. “I know first-hand that the TLX is a good car,” she said. “I like the control that I have in the car. I feel that it hugs the road and it does what I want it to do. It’s maneuverable, and it stops in its tracks when need be. Weisbrod said the dealership situated in the Valley Automall generates excellent traffic, especially with the wide assortment of Acura models that are available. “This is a family-owned dealership,” she said. “The Findlays are very concerned with the welfare of their staff, and they promote from within. They take care of their employees and customers. In addition, Weisbrod said the recently remodeled dealership is comfortable and attractive. Situated at 315 Auto Mall Drive, Findlay Acura is part of Findlay Automotive Group, founded in 1961 by the late Pete Findlay, whose son, Cliff, now oversees 28 dealerships in Nevada, Arizona, Utah, Idaho and Oregon. Further information can be found by calling 702-982-4100 or by visiting www.findlayacura.com.